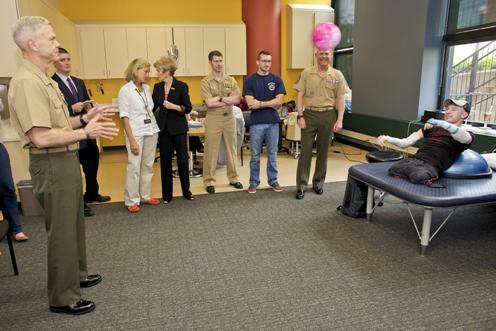 Commandant Gen. Jim Amos and Sergeant Major of the Marine Corps Mike Barrett visited Johns Hopkins Hospital in Baltimore last week, intent on seeing Army Sgt. Brendan Marrocco, the first American serving in Iraq or Afghanistan to survive a quadruple amputation. As I outlined in this feature story, the trip renewed a friendship between the commandant and the soldier, a wise-cracking infantryman with an (unfortunate) love of the New York Yankees. In December, he became the first veteran of this generation’s wars to receive a double-arm transplant, and he has pushed hard with his physical therapy since. Marrocco doesn’t yet have feeling in his new hands, which came from a cadaver. He was glad to show how far he’s come, though. At one point, the commandant asked him to “pepper it in there” and throw a rubber ball at him. Marrocco, seated with no prosthetic legs on, responded by cheerfully snapping it straight at him. The visit served a second purpose, however. The commandant and the sergeant major had serious questions about treatments that are available for service members who are seriously injured by bomb blasts. The unfortunate assumption, Amos said, is that if you step on an improvised explosive device on a foot patrol, you probably lose both legs. And that’s to say nothing of the gruesome injuries someone can sustain to their genitalia, which many of us who have walked the ground in Afghanistan fear most. Dr. Andrew Lee, the surgeon who led the operation on Marrocco, told Amos and Barrett that they the stigma to receiving a transplanted arm or hand is diminishing. As soon as a recipient can use it, he said, they claim it as their own. The process doesn’t end with surgery, however. It takes serious work to gain maximum use of a transplanted hand or arm, and a strict regimen of drugs to make sure the body does not reject the new body part. At least one individual who received a transplanted hand later lost it, Lee said. Still, there’s hope for a better tomorrow — and not all service members know it. 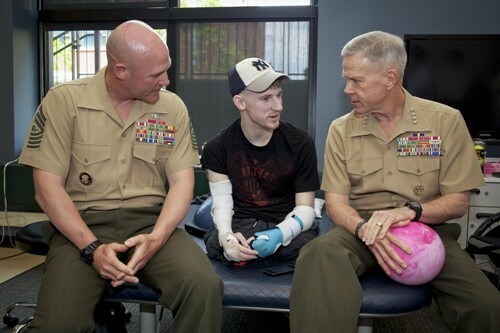 Amos said he recently asked a Marine who lost a hand while serving as an explosive ordnance disposal technician if he had considered getting a transplant, and the man wasn’t aware that was a possibility. There’s also the matter of “losing your manhood,” as troops typically put it. Lee told Barrett that a variety of research is ongoing in this regard. Johns Hopkins is researching the possibility of transplanting cadaver penises, Lee said, and other institutions are studying how to regrow tissue. In the middle of all these conversations, you find folks like Marrocco. David Wood’s Pulitzer Prize-winning series “Beyond the Battlefield” explored the pyschological effects that major blast injuries cause, but you also find individuals who are willing to push through to find the new best “normal” they can. Marrocco said he can’t wait to go quail hunting with his new hands, and with his positive attitude, it’s hard to believe it won’t eventually happen. He lit up with a grin when his doctors described to Amos how much he enjoys proving doctors wrong on how quickly he can recover function in his hands.